A fashion wonderland for tiny tots, Tiny Wardrobe is an export surplus store showcasing dreamy dresses, cutesy tees, and stylish jackets. Prices begin at a modest 250. Sometime last year, we introduced you to the awesomeness of Wardrobe in Kalyan Nagar, an export surplus store that boasts of a curated collection for men. Well, they now have a kiddies store right next door. 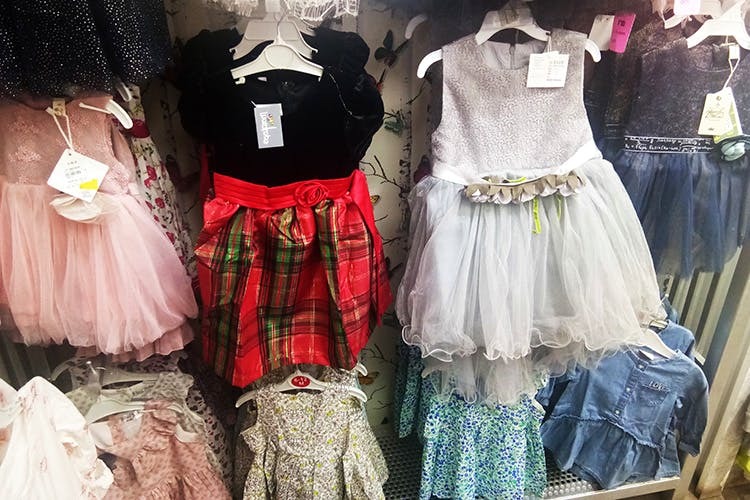 And if you’ve got a fashion conscious little dude or dudette (between the age of one and seven) at home, this place will make them and your wallet happy. Just like the main Wardrobe, Tiny Wardrobe too has a curated collection which in the world of export surplus stores is a rarity. We browsed through their collection and found adorable tees for both boys and girls starting at just INR 250. You can pick off-white tees with pink pom poms from Cherokee or ones screaming ‘Hug Me’ or others with funky shoe prints from the Spanish brand Mayoral. Tom Tailor and Hunny Bunny make an appearance too. On one end of the store, there is an entire wall dedicated to sparkly dresses some of them from Disney and will make your little one feel like a Princess. The not so fancy ones come with floral prints and cost about INR 450. You can also snap up tiny pairs of jeans and slacks for a little more than INR 500 a pair. They have cool jackets and backpacks too.